The Index gives credit for generous and high-quality aid, financial transparency and incentives for foreign direct investment, robust support for technological research and development, policies that protect the environment, open and fair trade policies, contributions to global security, and open immigration policies. Scores are reduced for barriers to imports from developing countries, selling arms to poor and undemocratic nations, barriers to sharing technology, and policies that harm shared environmental resources. Why does the CDI matter? The behavior of rich countries and powerful institutions profoundly affects the lives of people in poor countries. Why does the CDI matter? Because in an integrated world, the behavior of all countries affects people around the world. The decisions made by industrialized countries about their own policies and behavior have repercussions for the poorest people in developing countries. The other side of the coin is that greater prosperity and security in poorer countries is good for the rest of the world, too, because it creates new economic opportunities and increases innovation while reducing the risks posed by public health, security, and economic crises. The CDI recognizes countries that pursue policies that not only benefit themselves but also the development of others while promoting the common good shared by all nations. 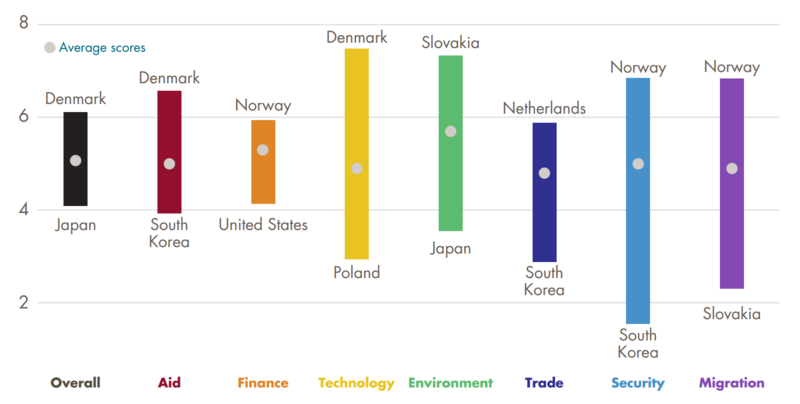 Denmark has the best overall score because of its very good and consistent performance across the board, with top marks in aid and technology. Japan is last overall despite strength in technology, with a last-place position on environment and second last on trade and security. All countries perform poorly on one or more indicators and could do much more to spread prosperity. Denmark ranks best on aid because of its generosity (0.85 percent of GNI) and effectiveness (a high score on the quality of aid). South Korea ranks worst with a small aid budget that is delivered relatively ineffectively. Norway does best on finance because of very good financial transparency and support for investment in developing countries. The United States comes last on finance, mainly because of relatively opaque financial secrecy rules and regulations measured in the Financial Secrecy Index. Opposite Denmark on technology is Poland, which spends only 0.35 percent of its national income on R&D (about one-third of Denmark’s 1.03 percent). Slovakia is in first place on environment with high gasoline taxes and low greenhouse gas emissions. Japan stands out as a poor performer with high tropical timber imports, low gasoline taxes, and limited reductions of greenhouse gas emissions. The Netherlands performs best on trade, imposing few restrictions on importing goods and purchasing services from other countries. In contrast, South Korea imposes some of the highest tariffs and imposes vast restrictions that stifle the import of services from elsewhere. South Korea is also last on security because it contributes relatively little to international peacekeeping, does not publish data on arms exports, and has not ratified major international security treaties. Norway is top-ranked with high contributions to peacekeeping, minimal arms exports, and participation in security treaties. Norway takes first place on migration, accepting a large number of migrants and bearing a large share of the refugee burden, unlike last-ranked Slovakia, which is relatively closed to migrants from developing countries. All countries perform poorly on one or more indicators, highlighting how much more all could do to spread prosperity simply by raising their performance to the level of other countries. It’s important how much aid countries give, but how well they give it matters too. Although only a handful of countries meet the internationally accepted target of spending 0.7 percent of gross national income on aid, foreign assistance remains an important source of finance for some of the poorest countries. The CDI rewards countries that give more aid than their peers as a share of their GNI, but it also rewards the quality of aid as measured by the Quality of Official Development Assistance (QuODA) assessment. QuODA examines each donor’s development assistance on 31 indicators of the accepted aid-effectiveness principles of development impact, fostering institutions, reducing burden, and promoting transparency. Denmark takes first place on aid because of its generous (0.85 percent GNI) and high-quality foreign aid. At bottom is South Korea, which contributed only 0.13 percent of GNI to aid and scores relatively poorly on aid quality. Norway gives the most aid as a share of GNI, more than 1 percent in 2013. It’s followed closely by Sweden and Luxembourg. In absolute terms, the United States gives the most foreign assistance, but it scores badly because its aid represents only 0.18 percent of its national income. Compared to other CDI countries, Slovakia was the least generous aid donor, contributing only 0.09 percent of its GNI. In aid quality, Ireland ranks top, followed by Denmark and the United Kingdom. According to the QuODA measures, Ireland has the best bilateral program while Canada has the most effective multilateral assistance (based on the quality of the multilateral agencies it chooses to fund). Italy and Belgium score at the bottom on bilateral aid quality, while New Zealand and Greece score at the bottom in multilateral. Foreign investment can drive growth and jobs in poor countries but also instability, corruption, and exploitation. Foreign direct investment is the largest source of financing for many developing countries, with benefits to infrastructure, housing, transport, energy supply, and many other areas. Successful investment in the developing world can benefit everyone. The CDI therefore rewards wealthy countries with investment-promotion policies that are good for development, such as political risk insurance. Policies that allow for financial secrecy, in contrast, enable tax evasion, money laundering, and corruption that are estimated by some experts to cost developing countries billions of dollars and degrade governance and international security. Using data from the Financial Secrecy Index (FSI), the CDI recognizes countries that have regulations in place to promote transparency in financial transactions within their jurisdiction. Norway takes the lead on finance for the first time with responsible support to investment and transparency in the financial sector; Finland and Denmark are close behind. Despite support for foreign investment, the United States ranks last because it does not properly monitor environmental and social impacts and has a poor score on the FSI. Denmark ranks best among the CDI countries on the FSI. The Netherlands, United Kingdom, and United States are penalized for enabling secrecy jurisdictions within their sphere of influence; Switzerland joins the United States near the bottom of financial secrecy rankings. Ireland is the only country without a national agency to offer political risk insurance for investment abroad. Although Canada ranks at the top in support for investment, its relative lack of financial transparency brings down its overall score. Technology and knowledge are key drivers of human and economic development. Pro-poor policies promote dissemination. The CDI rewards government support for research and development and policies that facilitate the creation and dissemination of innovations of value to developing countries. It marks countries down for policies on intellectual property rights that can inhibit the international flow of innovations. Denmark, South Korea, and Portugal score best on technology, thanks mainly to government and business expenditures on research and development. Poland and Slovakia rank last with expenditures on R&D totaling less than 0.4 percent. South Korea’s business expenditures on R&D significantly exceed those of other countries. European Union member countries lose points for promoting compulsory licensing bans and pushing for bilateral trade agreements to include “TRIPS-Plus” measures, which restrict the flow of innovations to developing countries. European regulations of intellectual property rights have become much stricter in the last decade, limiting the spread of technologies. In contrast, New Zealand, Canada, and Australia have less stringent intellectual property rights policies that enable better sharing of innovation and knowledge. Climate change is regressive—awful for the rich, but catastrophic for the poor. Rich countries are most responsible for anthropogenic climate change, but poor countries will suffer the most because they are more susceptible geographically and have less money and capacity to deal with the effects. Also, much of the world’s poor depend directly on their surrounding environment to meet their daily needs. Healthy ecosystems provide shelter, clean water and energy, food security, and income opportunities. Many policies and actions of richer countries degrade the natural resources on which the poor depend. The CDI therefore rewards countries for decreasing greenhouse gas emissions, implementing high gas taxes, not subsidizing the fishing industry, cutting imports of illegally harvested tropical timber, and committing to important international conventions. These measures benefit all countries— rich and poor—and time is running out for serious action to prevent damaging climate change. Sweden takes the second place partly because it has the lowest greenhouse gas emissions. The Czech Republic, Hungary, Poland, and Slovakia score well on emissions in part because of significant recent improvements in the post-communist era. Norway scores well on emissions, but ranks poorly overall because it produces the largest amount of fossil fuel per capita, followed by Australia, Canada, and the United States. Australia also ranks poorly as the biggest emitter of greenhouse gases per capita. The United States and Canada are the only CDI countries that are not party to the Kyoto Protocol, so far the most serious international effort to deal with climate change. Rich countries call the shots in trade negotiations; some poor countries lose out. Trade provides poorer countries with opportunities to attract investment, create jobs, and reduce poverty. With rich countries in charge of the rules of trade, however, some goods that poor countries are best at producing still face trade barriers in rich countries. High tariffs, domestic subsidies that artificially make agricultural goods from poor countries too expensive, and burdensome red tape and legal restrictions all make it difficult for developing countries to complete and reap the benefits of trading on a level playing field. The CDI rewards the wealthy countries most open to goods from developing countries, with low tariffs, few subsidies if any, and streamlined importation processes. Like much of the CDI, this is an example of a set of policies which would benefit the consumers and taxpayers of wealthy countries as well as poor people in the developing world. The Netherlands, Denmark, and United Kingdom take the top places on trade mainly because of their limited red-tape procedures and openness to trade in services. Japan and South Korea finish last with the highest tariff rates on rice and Korea’s tariffs on grains, seeds, and nuts. The Netherlands has the fewest restrictions on imports of services, according to the Service Trade Restrictions Index, whereas Denmark has the least burdensome import procedures. In contrast, Switzerland has the most restrictions on purchasing foreign services, and Slovakia strains importers with unnecessary red-tape measures. Australia, New Zealand, and the United States are ahead of the pack on low import tariffs. In general, EU nations share common trade and agriculture policies and therefore score average on this measure. Norway and Switzerland languish near the bottom with high tariffs on meat, dairy products, and grains. Security and development are closely linked. War and political violence can destroy livelihoods and public institutions, while poverty and institutional weakness in turn make it easier for political violence and war to erupt. Such conflicts do not respect borders; it is therefore in the interest of all countries to support peace and international security. The CDI looks at four aspects of the security-development nexus: it rewards countries for contributing to peacekeeping and humanitarian interventions, for basing naval fleets where they can secure sea lanes, and for participating in international security regimes that promote nonproliferation, disarmament, and international rule of law. The CDI penalizes countries for some exports of arms, especially to nations with undemocratic regimes. Rich countries have the power to enhance or degrade the security of people in developing countries. Norway, Denmark, and the United Kingdom lead the rankings on security for their significant contributions to internationally sanctioned peacekeeping and humanitarian interventions and for ratifying major arms control treaties and the Rome Statute, which created the International Criminal Court (ICC). South Korea is at the bottom for the lowest contributions to peacekeeping operations and failure to ratify the Mine Ban Treaty and Convention on Cluster Munitions. Along with Australia, it does not make data on arms exports publicly available. Sweden and France are penalized for exporting a large amount of arms to poor and undemocratic countries, as are the Czech Republic and Germany. New Zealand and Japan earn perfect scores on arms exports to developing countries (they have none), but Japan lags on other parts of this indicator because of its low international military profile. The United States is penalized for not ratifying the Ottawa Convention and loses additional points as the only CDI country that is not party to the Comprehensive Nuclear Test Ban Treaty or ICC. Migrants from poor to rich countries send billions back to their families each year, a flow surpassing foreign aid. Labor mobility is potentially the most powerful tool for poverty reduction and income redistribution, and there is no significant evidence of a harmful “brain drain” effect of skilled migration. By migrating to richer countries, workers gain valuable skills and broaden their opportunities to earn higher incomes. They also send billions of dollars back home each year in remittances, a flow that surpasses foreign aid severalfold. The receiving country also benefits from the contribution that migrants make to the economy and society. The CDI rewards countries for accepting migrants and students from developing countries, sharing the burden of refugees and asylum seekers, embracing migrant-friendly integration policies, and signing up to important international conventions protecting the rights of migrants. Norway takes first place on migration, mainly for accepting a large number of refugees and asylum seekers. It is also signatory to important international conventions on migration and has friendly and open migrant integration policies. Slovakia, Hungary, and Japan rank at the bottom. Japan is not a party to any important international migration agreements, Slovakia accepts the least migrants from developing countries, and all three countries lack effective policies to integrate migrants. Sweden and Canada follow closely behind Norway, scoring highly in all areas. Sweden scores particularly well on accepting refugees and asylum seekers, whereas Canada is recognized for accepting a large share of students from developing countries. 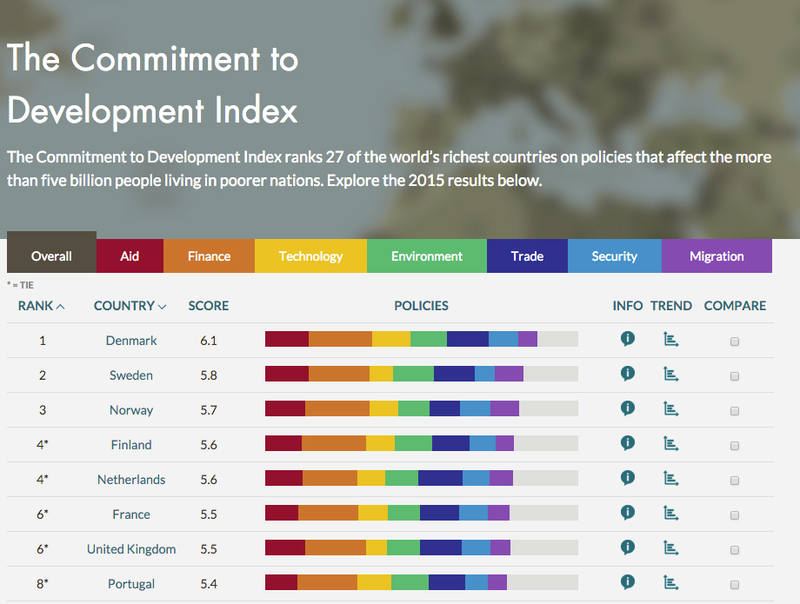 Visit cgdev.org/cdi to explore the Commitment to Development Index, view additional publications and background papers, and dive deeper into the CDI methodology, data, and code. 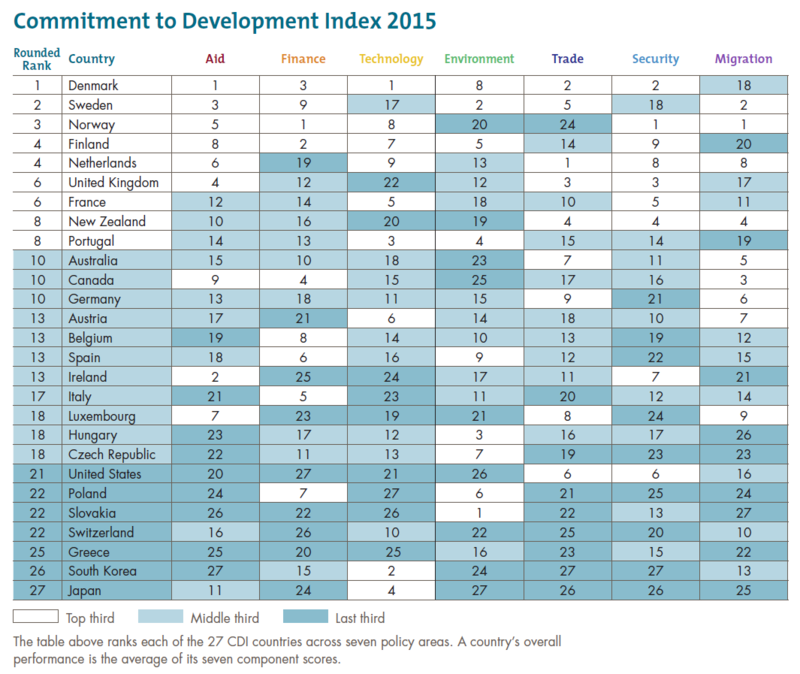 The Center for Global Development (CGD) has compiled the Commitment to Development Index each year since 2003. CGD is an independent think tank that works to reduce global poverty and inequality through rigorous research and active engagement with the policy community. CGD Europe director and senior fellow Owen Barder directs the Index, building on the previous work of former senior fellow David Roodman. Petra Krylova is the CDI coordinator. The Index is supported by the CDI Consortium, which in 2015 included the following countries: Australia, Canada, Denmark, Finland, France, Germany, Norway, Sweden, and the United Kingdom. The content of this report does not reflect the official opinion of the Consortium members. Responsibility for the information and views expressed therein lies entirely with the authors.